White Paper Abstract: Telehealth, the fastest-growing segment in healthcare, is no longer reserved for rural populations. Instead, telehealth is proving to be a game-changer across the care continuum, as the industry tests the use of tele-psychiatry, tele-ERs, tele-ICUs and even telepharmacy to bridge care gaps and to make healthcare more accessible and efficient. The percentage of healthcare organizations using telehealth rose from 63 percent in 2015 to 74 percent in 2018, according to the latest Telehealth & Remote Patient Monitoring Survey by the Healthcare Intelligence Network (HIN). During that same period, adoption of virtual visits jumped from 45 to 61 percent, lending new meaning to the phrase “The doctor will see you now” as providers, payors and patients embraced the ease and convenience of care delivery via phone, laptop or tablet. Virtual provider visits topped the list of telehealth applications for respondents to the 2018 survey, HIN’s fifth comprehensive telehealth assessment since 2009. 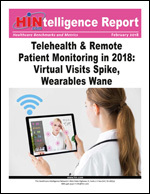 Download this HINtelligence report for more data on the top telehealth target, the top challenges to telehealth implementation, the primary application of data obtained from healthcare wearables and trends in remote patient monitoring usage.